These smooth and creamy Dole Whips will bring back memories of your favorite treat at Disney. If you’ve ever been to Disneyland there’s a pretty good chance that you’ve had their famous Dole Whip. Making a stop at Tiki’s Juice Bar is one of the first stops of many when they walk through those magical gates. I love the smooth, creaminess of Dole Whips and could eat them everyday; unfortunately I live about 11 hours from Disneyland and even if I did live closer I couldn’t justify going to Disney every time this tropical craving struck. So in true frugal fashion I scoured the internet (a.k.a. Pinterest) for recipes. To get the look of the Dole Whip I would need an ice cream maker; and I didn’t have that, so I knew making a true copy cat recipe was out of the question. But what I did have was my favorite kitchen appliance, my Blendtec! I also didn’t have a lot of time. Most recipes called for letting the whip sit for a few hours in the freezer, which you can do with this recipe too if you want more of a slush-y texture. We ate ours straight out of the blender, well we poured it in to glasses first, and they were perfect. Smooth, creamy and packed full of pineapple goodnes; just how I remember the original Dole Whip being. So if you have a craving for this Disney classic, don’t run to Disneyland (ok well if you can, do go to Disneyland and ride Pirates for me while you’re there), just head into your kitchen! Place all 3 ingredients in Twister Jar and blend on low for 30-40 seconds, twisting the lid counter clockwise until desired consistency is reached. Place crushed pineapple, whipped cream, pineapple juice, lemon juice and lime juice in blender jar. If your blender has an ice cream button blend on ice cream, if not blend on low for 20 seconds and then high for 20 seconds. 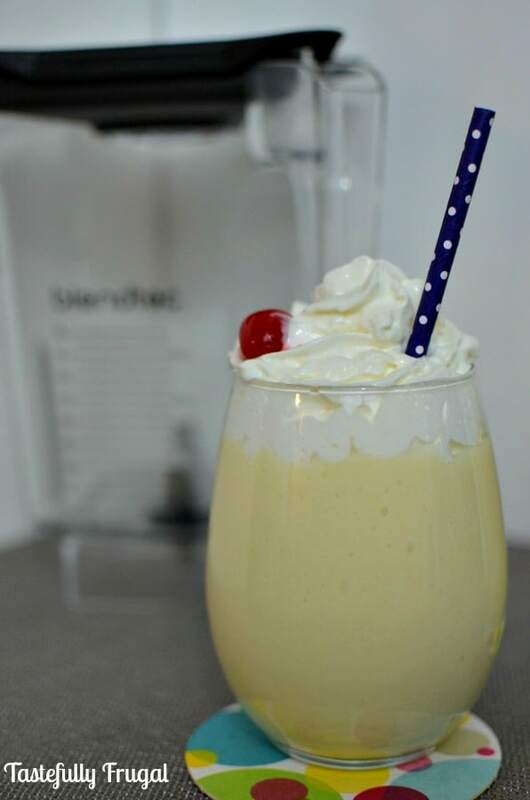 For a slushier treat let sit in freezer for 1-2 hours and blend on low for 10 seconds before serving. I couldn’t have made this without my Blendtec, especially the Whipped Cream, which is my new favorite recipe, and because I was super busy last month for my one year blogiversary I decided to celebrate my 13 month blogiversary by giving one lucky reader my favorite-ist of favorite things; a Blendtec! One of you is going win the Designer 725 Blendtec with Wildside+ jar AND Twister Jar. I use my Blendtec at least 3 times a week and I can’t wait for you to see how great it is too! So enter through the Rafflecopter below and I can’t wait to see what you create! I am kind of obsessed with blender foods! If I had a Blendtec, I would probably end up making most of my food in it each week, especially cold soups like Gazpacho, fantastic smoothies each morning, and I would start grinding my own flours and fresh spice blends. In short, it would be heaven on earth! These Dole Whips look like a good first choice! 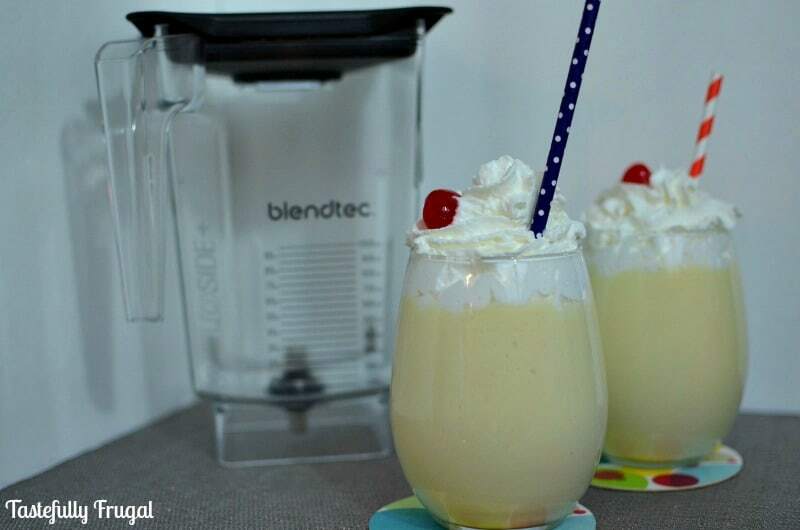 The first thing I would make with the BlendTec is a Dole whip! I did not get one last time I was at disney because the lines were so long but it sounds amazing!!! Great giveaway, and happy 13 months!! A Smoothie!!! I love making green ice cream also! YUMMY! Okay I would love to win this give-a-away, but even more, this recipe looks amazing! I love the Dole whips, but like you, I have never tried it because I don’t have an ice cream maker. I will be trying this recipe for sure!!! 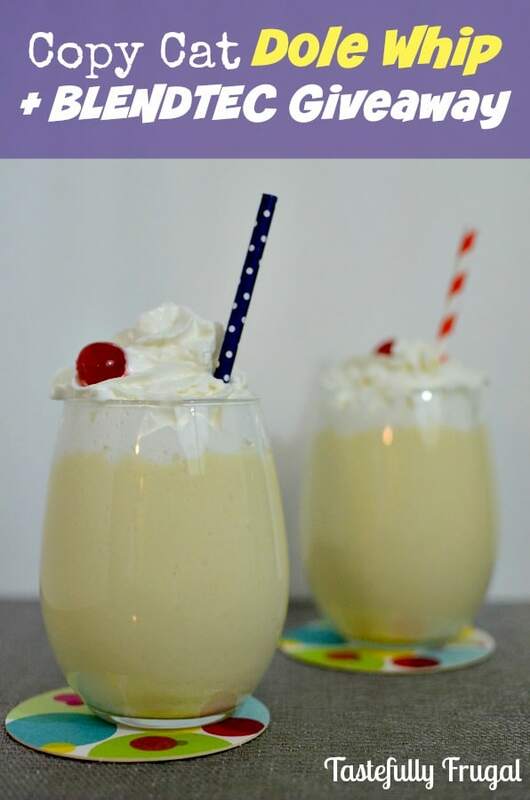 I would make these copy cat dole whips! YUM! Jill @Utah Sweet Savings recently posted…GIVEAWAY! Southern California Family Vacation Package w/ 2 Theme Park Passes – Includes Disneyland!! Sydney you are such an awesome blogger! I learn so much from you. I would make smoothies and sauces and soups and so much goodness with my Blendtec if I win. I hope I do! Have a great day! My girls love to have smoothies for after school snacks. While they are doing their homework, I mix up some juice, fruits (and veggies), with some almonds. The extra protein seems to give them a boost of energy (without the added sugar). This would be a great blender to use! I’m going to make a very berry smoothie! Probably my mom’s orange julius recipe!! I’d get working on my green smoothies! i’m going to make a delicious fruit smoothie. I have a Blentec and it’s AMAZING!!! I tweeted so hopefully you’ll get some additional entrants! Cauliflower soup then a smoothie. Enchilada sauce, mango smoothies or soup-it’s a toss up! I’d love to make this Dole Whip!! Thanks for the giveaway! Strawberry smoothies for everyone LOLOL! So many options I would love this! A green smoothie! Thanks for this great giveaway! I’ve wanted one of these since you first mentioned it to me! I think ice cream is going to be the FIRST thing I’d make with this since we’re sooo close to summer. But the list for its uses is a long one! I’ve totally make a Dole Whip! I’ve actually never had one 🙂 They look and sound amazing!! 🙂 Have a great week, friend! Great giveaway, Sydney! Love the recipe, too…..you’re seriously killing me lately with all of these delicious recipes. My pregnancy self can’t contain the cravings and temptations….I have no self control! Must try this and all the others soon 🙂 Thanks for sharing! Dole Whips are so awesome. They are one of our favorite treats at Disneyland. And I love all that the Blendtec can do! Aimee C recently posted…Win a Southern California Vacation! The first thing I would make is a green breakfast smoothie. Thanks so much for sharing this delicious recipe and for the chance to win. If I win, this will be the very first thing I make. never had a dole whips but looks yummy!!! I’m going to make a protein shake every morning for breakfast! I’m pretty sure a Blendtec would get daily use at our house. We have the original Ktec and it’s still going strong after 25+ years. Happy blogiversary!! I’m having my first year’s this week too! This is an awesome giveaway, my husband makes the best chocolate malts so that’d probably be the first thing in it 🙂 I’ve never been to Disneyland or heard of these whips but man, this might have to be the second thing we make! I am definitely going to make dole whips first, with the blendtec! I love them at Disnelyand! My husband and I are trying to lose weight and just went paleo. So I would try to find a way to make the dole whip paleo friendly. I only have a hand blender stick thing and it is garbage. My green ‘smoothies’ are more like chunky – stringy – lumpy drinks so I would have to make one too. Then I would make the frozen banana blended with cocoa powder and strawberries that I have heard tastes amazingly like ice cream. Amazingly generous giveaway. Thank you. I would make some nut butters and nut milks! I hope I win! I could really use this! The possibilities of what I may make first are endless…. First would be a smoothie for me! Then bring out the cookbooks and see what’s next! Love my Blendtec! Even when I traveled across the U.S. temporarily, I HAD to bring it. The first thing I would make is an Orange Dream smoothie or some pesto!!!! Dole whips are amazing! I would love a blendtec to make delicious green smoothies, soups, and of course- dessert! I’ve been wishing for a new blender for years. I would love to make some healthy smoothies for my two boys for breakfast. The first thing I would make would be a smoothie! Our Kitchen Aid blender makes the WORST smoothies and it’s so disappointing! Thanks for the chance to win a Blendtec! It’s a toss up between the Dole Whips, and a green protein-filled breakfast smoothie…both are on the top of my dream list! I’d make some milkshakes first things first, then the next day some healthy smoothies. I can’t wait to make this Dole Whip. Forget Disneyland! I love smoothies after the gym. I also make my own soups so would love a Blendtec. I will be making the Dole Whips also! I would try a strawberry smoothie. Thanks for the chance to win a fabulous blender! The first thing I would make is a pineapple, leafy greens, banana smoothie. Dole whip 🙂 and smoothies…. I’ll be making these Copy Cat Dole Whips with my new Blendtec. I would love to try the Dole Whip! I always see them in blogs, but have never tried one. Though the first thing I would make in a BlendTec is probably my morning green smoothie! 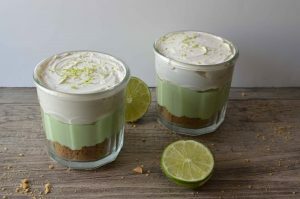 No Bake Key Lime Pie, then Copy Cat Dole Whip to go with it! If I win I would love to try the Dole Whip. It would take me back to my childhood. The Dole Whips of course! Almond Butter is the first thing I’d make! The first thing I am going to make is coconut butter. The first thing I would make with my blendtec, if I were chosen, would be some full-fat high-calorie smoothie blends for my g-tube fed 3 year old. She was born with a life threatening congenital diaphragmatic hernia and we are desperate to help her wean from tube feeds to oral feeds. Thanks for the opportunity to win! Wow, I’ve really been wanting a Blend-tec for a long time! I really want to make some soups and of course, smoothies! This Dole Whips recipe looks awesome and oh so simple! Will be trying this whenever I can be able to get one of these awesome blenders. I’ll make some dole whips. I would love to try and make chocolate hazelnut spread, or maybe a nut butter. I would make a green smoothie to help my kids eat their veggies! Great give a way! I saw a recipe for mint chocolate chip ice cream using just bananas, spinach, mint extract, & chocolate chips. I need a Blendtec to make it! I’d make a kale green smoothie! I can’t wait to try the dole whip! I will try this Dole Whip. I’ve never had one but it sounds delicious! Love our Blendtec, a Classic 540. We have green smoothie most mornings. Would love to have the ice cream setting! I would make a green smoothie that didn’t just taste like the “Green” part. Oh my gosh, I love dole whips! That would totally be the fist thing I would make. I feel like I should say smoothie, but I would love to try out the soup recipes. Yum! I’ve never had a DOLE WHIP…so this would be the first thing I would try!! Thanks for the opportunity! I’ve heard of these Dole drinks before and I am dying to try one! What an incredible giveaway! 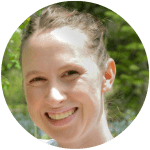 I would love to make the Dole Whip and all the other goodies you share on your blog, hoping to learn enough to create my own one day. I SO hope I win! Thanks for sharing! The first thing I would try would be a soup. I am going to make kefir smoothies! Probably the Dole Whip! And then, smoothies. Yum. Never tried a Dole Whip, but this looks yummy. First thing to make with a new BlendTec would be your Dole Whip recipe…The line was w-a-y too long when we were at Disneyland last month and I’ve been craving one. I’ll make homemade Pesto or Hummus! Awesome giveaway!!!! Thanks for the chance!!!! I would love a Blendtec! I must try the Dole whip and I am loving the whipped cream frosting, can’t wait to try them all! Love your blog, wish I had found it sooner! My favorite favorite thing…DOLE WHIPS!!! The first thing I am going to make with my new Blentec Blender is some marinades. The first thing i’m gonna do ist a biiiiiiiiig green smoothie with pineapple, bananas, spinach and wheatgraspowder. yummi! The first thing I would make is a smoothie! I think the first thing I would make would be a yummy smoothie! I would love to win and make a strawberry banana smoothie! Dole whips! They look great! I’m going to make banana ice cream!!! The first thing I would make is a green smoothie!! I would probably make a smoothie first thing. My other blenders can’t quite do the job. I want to try working in some green smoothies! I’d make the Copy Cat Dole Whip! I would love to try a Dole Whip with a new Blendtec! Enjoy making smoothies as well. I would first grind whole wheat berries and make bread with it. I know I would make smoothies and protein shakes for my disabled dd, but I would love to see what else a Blendtec can do! I’m going to make some creamy almond butter homemade! I will probably make a smoothie. This looks easy enough, even for me! im going to blend my tube fed kiddos meal for him! I want to make coconut butter!!! the first thing I would make is homemade peanut butter!!! I will probably make a smoothie but I would love to try all of the options available with such a great tool! Thanks for the chance to win! Congrats on your 13 months!!! I think the Dole Whips would be a good first choice or banana ice cream. First thing I would like to try is Spring Green smoothie. First thing I’d make, these Dole WHIPS!!! I believe the first thing I would make would be that Dole Whip. I still remember how dreamy they were when were at Disney a few years ago. This recipe looks scrumptious! I would make this first! Looks so delicious! When we were at Disneyland a few weeks ago, the line was out of control! I’ve been wanting one of these blenders for some time and the dole whip smoothie sounds yummy! I love to make smoothies….no telling what I’d find to make with the BlendTec! Smoothies! Or maybe margaritas….. that’s kind of a smoothie, right?? I’d make my morning smoothie. Never had a dole whip, so I’d def try this recipe. I’d also make green smoothies, almond milk & nut butters! A drink sounds like a good idea, but one of those green ones with parsley and such that you just can’t make in my old, sad, weak conventional blender! I am going to make my classic green smoothie that I eat every day – spinach, banana, frozen fruit, chia seeds, greens powder, maca powder, a splash of OJ, and coconut water!!! A smoothie! With frozen berries! Is the giveaway open to Canadians? a smoothie for my little and big loves; strawberries and banana and ice cream topped with whipped cream, yum! i soooooooo want /need one of these blenders! If only I didn’t need a new hot water heater, new dishwasher, new washer/dryer, a remodeled kitchen and bathrooms…I would have one!! The first thing I’d make in this Blendtec is a green smoothie. I’m going to make those dole whips, they sound really freaking yummy. I make smoothies everyday for my son, but our cheap blender just broke! So that is what I would make if i had a blendtec. These Dole Whips and Spinach Ice Cream! I’m making a mocha frappachino! I was just talking to a friend about these. She was telling me how much she loves pineapple whips and I was thinking I needed to come up with a home recipe. Yummy…can’t wait to try this recipe out! I imagine the first thing I’d make would be my morning smoothie, which I currently make in my old second-hand blender every morning. Beyond that? Soup, I think. Definitely frozen sweets–that Dole whip recipe looks tempting. I would really LOVE to make that “Dole Whip”!!! I would make some homemade roasted garlic hummus! I have so many i would love to try. My mom had same great ones. I cant wait to try your smoothies too. The first thing I would make is ice cream ….and smoothies. A cheesecake smoothie that I have been longing to try! I love the idea of making whipped cream with the blender! I’ve never thought of that and to make it 1000 times better – that real whipped cream turns into a delicious dole whip – my all time favorite treat at disneyland! First thing i would make is a delicious protein smoothie. Yum!! I love pineapple anything!! These yummy looking Dole Copy Cat Whips! Thanks for sharing! got to try a the dole whip! That sounds and looks so cool! I will make a strawberry banana smoothie. A healthy green smoothie..without seeds and gunk left in the blender. I think the first thing I would make would be smoothies! I would make my kids a strawberry/banana smoothie for breakfast! The 1st thing I am going to make is a strawberry and banana smoothie. I would make a pb pie recipe I have that was a pain using my ancient blender. I think I’d make some red bell pepper soup. Or a smoothie. I would like to make roasted butternut squash soup! The first thing I would make would be strawberry daiquiris! I will make a strawberry smoothie. I would make a fruit smoothie. Nut butter! I am addicted to it right now and currently using my food processor which is doing a okay job on some of the butters. 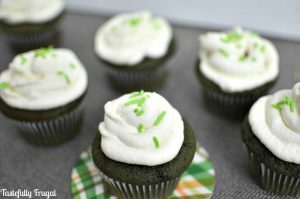 Nom Nom Nom…I am going to try this copycat recipe, and soon! 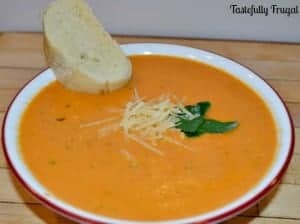 I would love to try the tomato basil soup! any other fruit, veggie or ingredient that happens to sound/look good at the moment! Yum, I would make a peanut butter and banana smoothie! I’d make a smoothie first – I’m sure it would be smoother than when made with my old blender. The first thing I will make with my Blendtec blender is a strawberry banana smoothie. I can’t wait! Yummy! I would totally make a smoothie and then spend hours trying all kind of things. I have a 3 yr old and 6yr old that are obsessed with this blender, every time we go to Costco and they are doing their little display my boys have to stop and talk to the lady about what they would put in the blender and how it would taste and they have convinced others that the blendtec blender is the best blender. If I got paid to have my kids sell the blendtec blender I might be able to afford one!! A triple berry smoothie. Love them! This dole whip looks awesome and I would probably make some almond butter first. The first thing I’m going to make is a strawberry banana smoothie. I’d love to try the Copy Cat Dole Whip. It looks delicious! I’s start with green smoothies and soups for my son. First thing I want to make is that delicious Whipped Cream that you listed above from Disneyland….I am craving one of those now. Yummy!! I think I could use that for everything that we make, endless possibilities. Thanks for the chance to win. I would make a chocolate milkshake. Ooo! This sounds delicious! I do love a good Dole Whip. I’m going to have to try it.